Clarkdale is not only the gate to the Sycamore Canyon Wilderness Area, but also an ideal location for any river excursion down the Verde River; with two river access points for kayak launches, birding and photography. Visitors can take a historic train deep into the canyon, hike along the river's banks, visit the Audubon’s Important Birding Area at Tavasci Marsh, or tour the ruins of the Tuzigoot National Monument. What better way to explore the Verde River than to have a local resident show you its most historic and cultural assets? The Clarkdale Kayak Company offers a trip down an exclusive stretch of the Verde River that provides a variety of exhilarating chutes and riffles, interspersed between scenic, tranquil pools. The Clarkdale Kayak Company is owned and guided by two lifetime friends, their amazing wives and a cadre of dedicated team members that provide a truly ‘local’ experience. Verde Canyon Railroad takes you on an exclusive ride through 20-miles of untouched wildlife and Red Rock beauty. Watch from the window of your meticulously refurbished train car or enjoy the fresh air from an open air viewing car as bald eagles, blue heron, and 74 other species of animals fly, swim, and interact in a uniquely picturesque setting. Breathe deep, order a drink, and relax as you glide along on a 4-hour journey through 100 years of history. Today over 90,000 visitors per year travel from all over the world to ride the rails into the Verde Canyon - so book your tickets early! 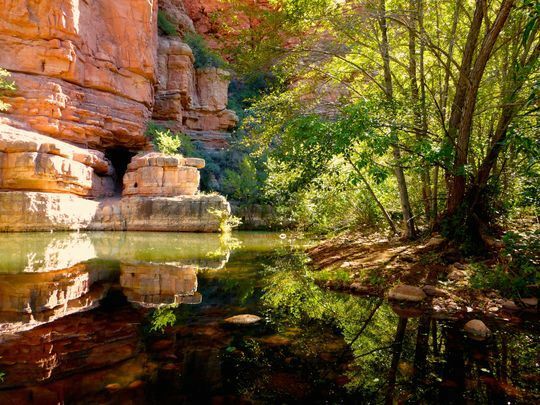 The second largest canyon to emerge from Arizona's Red Rock Country is a lesser known, but just as scenic cousin of famous Oak Creek Canyon. In Sycamore Canyon, you won't find any roads, developed campgrounds or crowds; just 55,937 acres of wilderness marked by colorful cliffs, soaring pinnacles and one of the world's rarest habitats, a desert riparian area. This is a truly local spot, with great swimming holes and miles of secluded hiking trails. Located where Sycamore Creek and its tributaries have carved out their space in the layered red rocks at the edge of the Colorado Plateau, this deep, branched canyon system extends for over 25 miles. Tuzigoot National Monument is located on the outer edges of Clarkdale. Part of the National Park Service system, this ancient pueblo ruin provides hands-on understanding to how the Sinagua people lived and prospered in the Verde Valley thousands of years ago. Excavated by out-of-work miners in the 1930’s, this exhibit is comprised of over 100 rooms dating back to 1000 AD, and over 3000 collected pieces on display in the site’s museum. Tuzigoot is a unique learning adventure for the whole family. Clarkdale is fortunate to house two Day Use points of access to the Verde River that are open year-round during daylight hours. The Lower TAPCO RAP is perfect for picnicking, bird watching, photography or just enjoying the sights and sounds that the River has to offer. Day Use recreationalists can walk along the floodplain from the Sandy Beach to the Boat Launch Site to watch commercial and private boats start their journey down the Verde River. Tuzigoot “Tuzi” RAP is located on the lower level of the Arizona State Parks’ property, known to locals as the “Lower Bench.” A short, ADA-accessible path, takes visitors to a viewing platform that overlooks the east bank of the Verde River. The Tuzigoot Bridge, a prominent feature to the north of the Tuzi RAP, is a popular destination for fisherman, boaters and other recreationalists.